Each January we celebrate the New Year, and then realize that it’s “that time of year” again! That’s the time that we take stock of our product line and decide what products will stay and which ones will get the chopping block. This is particularly difficult for us here at Solid State Instruments since we are a low volume, high mix business. We pride ourselves in helping our customers solve problems and in any given year we may or may not build and sell some of the more specialized isolation relays and other KYZ pulse metering products. Following the release of the PRL-1200 Wireless Pulse Link last August, we are retiring the PRL-900. Due to the industry's move towards all-electronic meters and the benefits of low-voltage relays, we are discontinuing our LS-Series line voltage relays. Also, you may have seen our recent product annoument that the PMC-1 Pulse-to-Modbus Converter is now available. In 2014 we introduced our new PRL-1200 Wireless Pulse Link. It’s been a big success. This second generation wireless pulse link system is such a big improvement that we’ve decided to discontinue the PRL-900, our first generation system. It just doesn’t make sense to keep both systems since the reliability and features of the PRL-1200 are so superior to the PRL-900. In addition, the PRL-1200 has a lot of room to grow and add new features to. We’ll be offering a retrofit kit for PRL-900 users allowing them up upgrade their PRL-900 to PRL-1200 with a minimum of cost. We also have updated the SPS-1 Solar Power Supply for the PRT-1200 Transmitter. The SPS-1 now has a larger 10 Watt Solar Panel and a larger battery with a 12 Amp-Hour capacity, providing a longer-life power source for times when an optional power supply is needed. Line voltage isolation relays are those that use line voltage as the wetting voltage across the meter’s KYZ pulse output. There are a number of problems with these relays for a variety of reasons, none of which are the isolation relays themselves. It is more directly related to the changing environment that the relays must operate it. Historically, line voltage relays were the first isolation relays. Using the 120V hot lead was an easy and convenient way to do the job and this worked just fine because all KYZ pulse initiator were mechanical at that time. This was because the meters used direct mechanical or electromechanical relays. Over the years, as KYZ outputs of the meters changed to solid state, this became a problem. Many of the meters do not have heavy duty enough solid state outputs to survive over long periods of time with line voltage used as the wetting voltage. Of course, it’s not a matter of the normal current or voltage, it’s the abnormal – usually the abnormally high voltage in the form of Voltage Transients that kills the meters’ solid state outputs. Second, as the meters have become all-electronic, it is important to keep the line voltage out of the meter – I know what sounds funny! – on the KYZ outputs. You are giving up an isolation barrier – a dielectric barrier – if you use a line voltage relay. If you use line voltage as a wetting voltage, then all the transients on the power line go right inside the meter across the KYZ output. There is not only potential for damage to the KYZ solid state switch but also for radiated electrical noise within the meter. It is our opinion that using line voltage as a wetting voltage is just plain bad practice on a solid state device. Yes, most meters contain some sort of transient suppression on their output but it is possible for a voltage transient with a high rate of change (dv/dt) to strike the solid state switching device before the transient suppression device can turn on and effectively clamp the voltage transient. Low voltage Isolation relays offer several benefits for working with today’s solid state meters. First and foremost, using a low DC voltage, like 12VDC, eliminates the problem with transient voltages altogether. Using a transformer-isolated power supply on the isolation relay which provides a low DC voltage to the meter’s KYZ output insures an extra dielectric barrier and helps any electrical noise from getting into the KYZ pulse metering circuit. A huge gain in reliability is gained in this manner. Because we feel so strongly about the additional benefits of Low Voltage Isolation Relays, we’ve decided to eliminate our RPR-1LS, -2LS- and -3LS line voltage isolation relays, not to mention that their overall volume of sales has been dropping for many years. We’ll still be glad to sell all remaining stock until supplies are depleted. 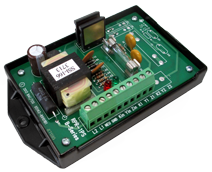 The RPR-1LS Relay is one of the Line Voltage Relays that will no longer be available. We highly recommend the Low Voltage RPR-1PS, shown below, instead. 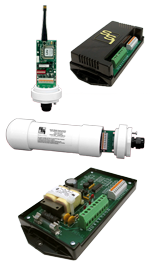 Our September 2012 Newsletter also covered the difference between these relays. Read Line Voltage or Low Voltage - What's the Difference? to learn more. Specifications sheets and installation instructions for the RPR-1LS, RPR-2LS, and RPR-3LS are still available under the Legacy tab of our Documentation webpage. Over the years, our RTR-2+ high-speed electric, water, and gas pulse relays have gained favor with some of the largest energy service companies in the country. Now by popular demand, we’ve developed a dual-channel version called the RTR-22+ High-Speed Water and Gas Relay. 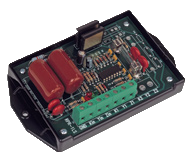 This relay is two RTR-2+ relays in one package and has numerous applications. One feature in particular is the ability to use the outputs in either the normal dry-contact mode or in the +5VDC sourced voltage mode to work directly with other instrumentation systems looking for 5VDC pulses. The RTR-22+ High-Speed Water and Gas Meter Relay is available now. Yep, it’s finally here! After a couple of years of development we’ve finally finished the PMC-1 Pulse-to-Modbus Converter. This device allows two channels of pulses to be read, recorded and accessed by Ethernet using the Modbus TCP protocol. Not only is Cumulative Energy recorded but other metrics that can be captured and accessed are Instantaneous, Average and Peak Demand.